Beautiful views of meandering waterways and tumbling waterfalls, dramatic sunsets and vistas of the desert's distinctive mountains, often seen with snow-capped peaks, can be enjoyed from the northwest orientation of this recently remodeled and updated lakeside Desert Home. The large pool and infinity-edge spa are located within the entry courtyard to benefit from its southern orientation. Along the rear elevation of the home is a second spa off the master suite, a elongated fire pit, abundant seating and lovely views creating a tranquil environment. 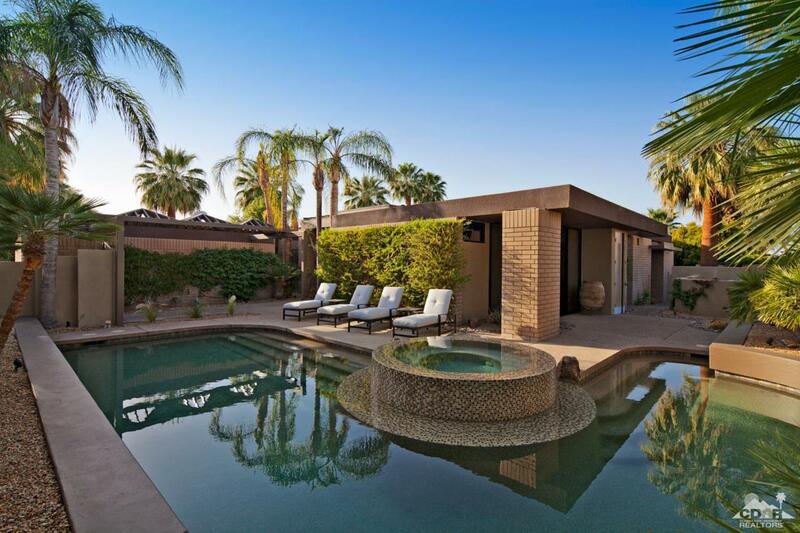 Designed for relaxation, the home's approximate 4,040 SF of desert living features a spacious step-down living room with walk-up down bar and focal point fireplace and media center. High-sloped ceilings, clerestory windows and skylights allow for an abundance of natural light. The large master suite with fireplace and a shared his and her bath is complimented by the addition of a charming guest suite and a den/study. Offered Furnished. Listing provided courtesy of Jamie, John Carmen Wolfe Team of Vintage Club Sales.